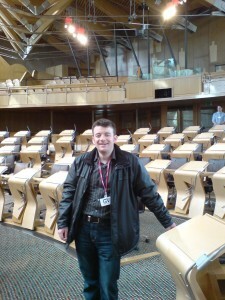 FOI Man sees two alternative futures for FOI at the FOI Scotland Conference. Is Scotland becoming less free with its information? That was the question posed by the organisers of this year’s Freedom of Information Scotland conference, held in Edinburgh last week. And to be honest, I came away with the impression that if anything, Scotland could teach the rest of the UK a thing or two about freeing up its information. But I also came away with a sense of how fragile the right of access can be. A bit of context first. Like the UK Government, the Scottish Government has just completed a post-legislative scrutiny of their FOI Act. And the week before last an FOI (Amendment) Bill was passed which made a small number of changes to the Act. Critics, like the Campaign for FOI in Scotland, have been scathing of the SNP administration’s lack of ambition. In particular, as in the UK as a whole, there is concern that FOI is not “following the taxpayer’s pound” as Margaret Hodge would put it, as more and more services are contracted out to organisations that do not face the same obligations as public bodies. Nicola Sturgeon MSP, the Deputy First Minister, who leads on FOI in the Scottish Government, not unsurprisingly argued against the premise of the conference’s subtitle. Her argument is that the FOI (Scotland) Act is already progressive compared to its contemporaries. This Bill was never intended as root and branch reform of the Act, but merely to tidy up a few inconsistencies. She pointed out that FOI is only part of a wider agenda of improving transparency in Scotland, pointing to the Public Records (Scotland) Act 2011 (which introduces new requirements for records management in public bodies and those providing public services) and the Public Services Reform (Scotland) Act 2010 (which requires public bodies to publish details of expenditure on public relations amongst other things). She also promised to bring forward an order to extend FOI to more organisations by the summer recess this year, which would be the first time that such an order had been made in Scotland. In an apparent side-swipe at the UK’s post-legislative scrutiny (though she actually cited Ireland, which we’ll come to in due course), she remarked that other governments had used their post-legislative scrutiny processes to weaken FOI. Only Scotland had emerged with stronger legislation. Carole Ewart of the Campaign for FOI in Scotland remained scathing of the Scottish Government, describing the Amendment Bill as “a wasted opportunity”. Judging by a number of comments made on Twitter, a number of Scots feel the same way. There is also a degree of cynicism over the promise to extend FOI, a promise made, and broken, many times before in the last decade by Governments of all hues. One of the things I looked forward to most at this conference was the opportunity to meet the new Information Commissioner in Scotland, Rosemary Agnew. Scottish authorities who rubbed their hands with glee on hearing that her predecessor Kevin Dunion was leaving the post will be disappointed if they thought this would lead to a softening of the Scottish Commissioner’s stance on FOI. Rosemary appears to be embracing her new role with zeal. One of her first acts in the role was to persuade the Committee looking at the Amendment Bill that the exemption relating to correspondence with the monarch and their heirs should not be made absolute as this would damage openness. As she commented, this in itself now makes the Scottish Act more open than the UK one, amended in this way in 2010. Rosemary explained that she sympathised with public authorities as before being appointed as Information Commissioner she had been the Chief Executive of one herself. 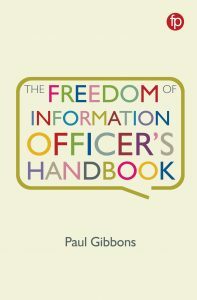 But her antidote to the increasing burden of FOI is not to limit the right of access, but to improve business practices, which in turn will help organisations to work more effectively across the board. It isn’t one thing, she argued, that makes it easier to meet FOI obligations, but a combination of improved procedures, better records management (Rosemary was unusually enthused about the importance of records management for a senior official) and culture change. Senior officers need to “live the culture of openness”. And FOI Officers heard Rosemary extol their work and make clear that supporting them is key to doing FOI well. I won’t disagree with her. 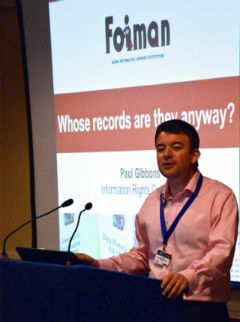 The conference also heard from someone who had used FOI – eventually – to obtain justice. Rab Wilson, a man with a way with words, and a nurse, told of his 6 year battle to procure the release of reports on serious incidents by the health trust he worked for. It was only a decision notice from the Scottish Commissioner that eventually validated his concerns after years of stress for him and his family. FOI in Scotland does not of course exist in a vacuum, and we heard about FOI changes in adjacent countries. Regular readers will be well aware of Dr Ben Worthy’s research into FOI implementation in the UK, and he was, as ever, eloquent on the subject. But the real eye-opener was Gavin Sheridan’s description of his attempts to use FOI in the Republic of Ireland. Since amendment in 2003, requesters in Ireland have to pay not only to make a request, but also for the cost of search and retrieval – his highest bill yet for which was 29,000 euros for a dataset, for internal reviews, and for appeals to the Information Commissioner. One request can end up costing many thousands of euros, putting FOI beyond the reach of most members of the public. Gavin set up thestory.ie in 2009 and his tale of using the Act to obtain information about Government departments was by turns both comic and Kafkaesque. His wry amusement at the series of obstacles put in requesters’ paths, including the need to submit requests in the old-fashioned way using envelopes and stamps, could not disguise his obvious and not unreasonable frustration with his country’s approach to something it is nowadays a struggle to call “freedom of information”. As our Government in the UK considers tampering with the regulations governing fees, we might well note his experience. Unfortunately I can’t report on the break-out sessions at the conference other than the two I chaired, but feedback suggested that they had been lively affairs and mine certainly were. I’ll write at another time about my session on blogging FOI. 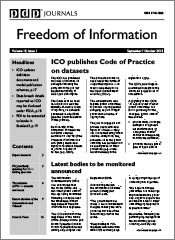 In the other session I chaired, Iain Bourne of the UK Information Commissioner’s Office talked about the ICO’s new Code of Practice on Anonymisation, which I’ve written about here before. My own conclusion, like many at the conference, is that Scotland remains progressive in its implementation of FOI, but campaigners and those who want to use it must remain vigilant. And from my own perspective, it underlined the need to do all we can to ensure that our UK FOI Act does not lose ground, for fear that it might become shackled like that of Ireland. I’d like to thank Holyrood Magazine Conferences and the Office of the Scottish Information Commissioner, who jointly organised the conference, for inviting me to take part, and for their hospitality on the day. I thoroughly recommend next year’s conference on the basis of my experience in Edinburgh last week. It was a superb conference that left me buzzing with renewed enthusiasm and I’m sure other attendees felt the same. And it was a real pleasure to meet so many friendly and enthusiastic people keen to talk about FOI in a positive way. Thank you for the write-up, Paul. It was a real pleasure to have your involvement. It’s a great pity that such opportunities are so few and far between but we certainly made the most of it this week!